Would you like to give your home a luxury feel at affordable prices? Then, choose classic tile flooring. This flooring option has been around for thousands of years for very good reasons that are as valid today as they were a millennium ago. Visit our showroom to see all our flooring options. Tile floors are a beautiful, clean, and versatile option that works well in any room of your house. Water-resistant, ceramic and porcelain tile are ideal for rooms with high humidity and splashes, such as the kitchen, bathroom, and basement. However, you don’t have to limit the stunning good looks of this flooring surface to just these rooms. Tile is highly appropriate for your foyer, living room, bedrooms, and dining room, too. Along with its timeless appeal, porcelain and ceramic tile flooring is easy to clean and maintain. Wipe up spills when they occur without any hassle. Sweep or dry mop when you notice dirt or debris. Simply damp-mop with a tile cleaning product once a week and your floors will always look clean and attractive. The manufacturing process of porcelain tile makes it very dense and strong. Comprised of quartz, clay, and feldspar, porcelain is fired in kilns at an extremely high heat. This makes it highly water resistant, which gives you many options for places to install porcelain in your home. Since this flooring surface is prized among homeowners, you will find by adding porcelain, you boost your property value significantly. And with help from our company, you can add this high-end flooring to your home at a very affordable price. Decorators love using this type of tile, as it has a clean, modern appeal. Combine that with the square shape of the tiles and the straight lines of grouting, and you have flooring that maintains a unique visual appeal. Valued for its elegance, ceramic tile is water-resistant, strong, and durable like porcelain, but it costs a little less, making it appealing to many homeowners. It is also softer than porcelain, so ceramic tile flooring is easier to cut and install. 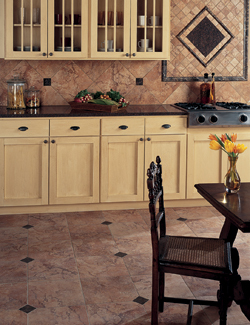 Find ceramic tile in a wonderful assortment of sizes, shapes, colors, and patterns. This type of tile readily lends its elegance to any room in your house. Talk to our design and sales professionals about helping you choose the tile that complements your home. Now that you have your tile picked out, let us schedule a day and time for professional tile floor installation. In our store, we employ floor installation experts, who possess the skill, training, and experience to lay your tile to perfection. Tile is among the more difficult flooring options to install. It requires precision and accuracy, as well as professional tools and supplies. Ask our experts to place your tile properly so it adheres to the mortar underneath and avoids damage. We offer lifetime warranties on flooring installation so you can feel confident that your tile flooring will look excellent for many years to come. If you should experience a problem, let us know and we will make it right at no expense to you. Call <PHONE> with your questions about tile flooring for your home. We proudly serve the communities of Tawas City, East Tawas, Oscoda, National City, and Au Gres, Hale, Michigan, and the surrounding areas.